The Toronto Maple Leafs announced Friday that the hockey club has hired Jacques Lemaire as a special assignment coach. Lemaire spent the past six seasons with the New Jersey Devils organization as a head coach (2009-10, 2010-11) and most recently as a special assignment coach. 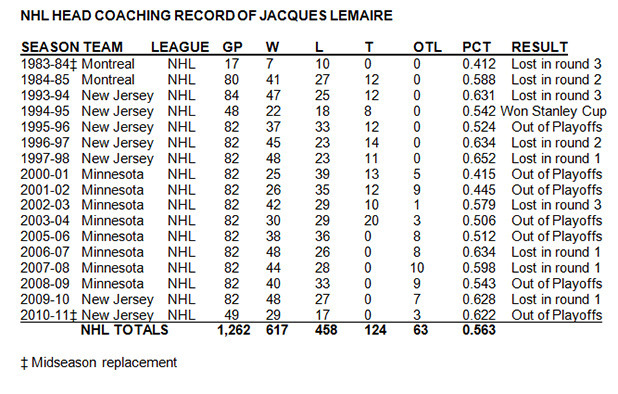 Lemaire, 69, has coached more than 1,200 games between Montreal, New Jersey and Minnesota. The LaSalle, Quebec native is an 11-time Stanley Cup champion – winning eight times as a player, twice as an assistant general manager and once as a head coach. Lemaire is a two-time winner of the Jack Adams Trophy as the NHL’s coach of the year and also won an Olympic gold medal with Team Canada while serving as an assistant with head coach Mike Babcock. “Obviously Jacques Lemaire has a wealth of experience. We had a great relationship from the 2010 Olympics and I’ve asked him to join our staff to help me and the rest of our coaches within the entire organization be the best they can be,” said Toronto Maple Leafs head coach Mike Babcock. As a player, Lemaire spent his entire NHL career with the Montreal Canadiens. He’s a former two-time NHL all-star and one of only six NHL players to have scored two Stanley Cup winning goals. Lemaire was inducted into the Hockey Hall of Fame in 1984.